You use PayPal Express on your Zen-Cart (ZC) site; however, the default PayPal express option shows the customer that they are leaving the website. 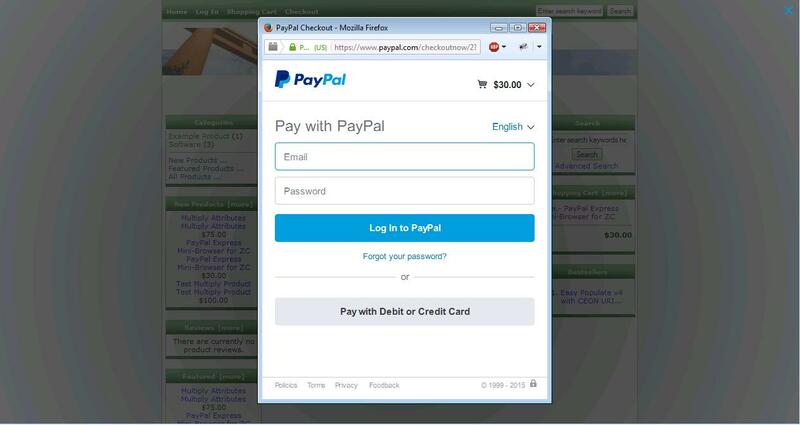 PayPal has developed a way to present the PayPal express payment option by using an in-context browser (sort of like a minibrowser) which is shown similar to a lightbox. This way your customers see that the paypal payment screen is tied to your site and can even see your site through the lightbox window. The code provided is the ZC standard code for each ZC version modified to address this plugin only and does not include other paypal files to which changes may be necessary to support communication with PayPal associated to the POODLE problem (Use of SSL3) which was fully resolved in ZC 1.5.5 out-of-the-box. That solution can be found at the zen-cart website in the Zen Cart Release Announcements in the specific thread: Important announcement about POODLE and payment security. These fixes should be applied as necessary for the version of ZC being used, and should be considered when merging this software into your cart. Compatible with ZC 1.5.0, 1.5.1, 1.5.3, 1.5.4, and 1.5.5. All versions are provided in the download file. Installation: load/merge the files of the common directory, then access the version specific folder for the version of ZC for which the files are to be installed.